By the year 2020, medical experts estimate more than 30 million Americans will have cataracts. So, it’s not surprising that cataract treatment information is of great interest to the public and news media alike. 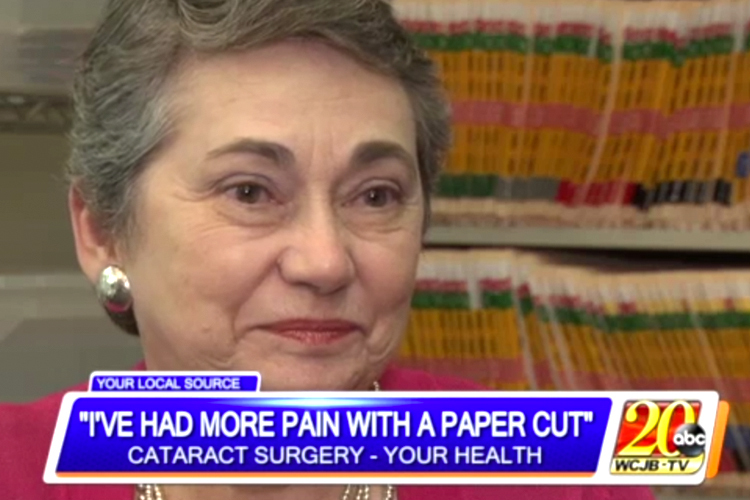 ABC affiliate, WCJB TV20, recently featured North Florida Cataract Specialists and Vision Care in a “Your Health” news segment to shed some light on cataracts. A cataract is clouding of the eye’s natural lens resulting from a build up of proteins. As new cells form, existing cells are compacted together. The damage is permanent and continually robs patients of their vision over time. For the segment, “Your Health” interviewed Sally Thompson, a North Florida Cataract and Vision Care patient from Gainesville, who shared the challenges she faced with cataracts, and how Dr. Gregory Snodgrass helped her see clearly again. Halos are a common cataract symptom, along with cloudy or blurred vision, double vision, glare, light sensitivity and lens discoloration. Symptoms may be minor early on, but inevitably get worse. An ophthalmic evaluation is required to accurately diagnose the progression of cataracts. Following her diagnosis, Thomson opted for laser-assisted cataract surgery. She said the experience was simple and painless. “It’s the easiest thing you could ever imagine. I’ve had more pain with a paper cut. I had the surgery in the morning. I was out by noon. I went home and took an hour nap and I went back to work. I worked until 5:30 that day." Faster recovery is a primary reason many patients like Thompson choose laser-assisted cataract surgery versus traditional cataract surgery. Laser-assisted cataract surgery produces less eye trauma, and thus, fewer trauma-related side effects. Many patients report improved vision before even leaving the recovery room. And both the surgery and recovery are pain-free. Contact North Florida Cataract Specialist and Vision Care today to schedule your consultation. Screen capture courtesy of WCJB TV20.